This week’s post is brought to you by Aubrey Hodges. I met her last year while climbing at gyms in Houston. She’s one of the sweetest/smiliest/happiest girls you’ll ever meet. 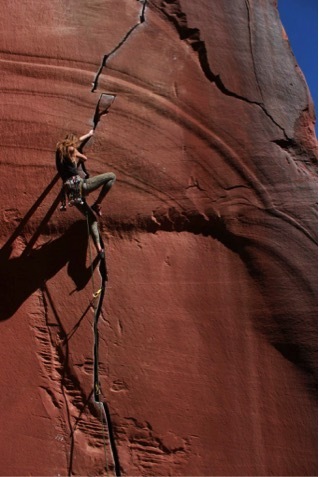 After she went to college I started noticing that all of her pictures were of her doing completely amazing trad climbing. She seemed to be head over heels in love with trad, so I asked her to write a guest post about her transition from sport climbing to trad climbing. Read on to see why Aubrey thinks #tradisrad and check out her awe-inspiring pictures. It almost makes me want to pick up a rack and head out to the desert! My name is Aubrey and I’ve been climbing for around two years now. I was introduced to the sport of climbing right before I turned seventeen. My life before discovering climbing was not ideal, to say the least. I didn’t have many friends in high school because it was hard for me to relate to my peers due to my home life. My mother was diagnosed with a degenerative muscle disease when I was twelve, and growing up in the stereotypical suburbs of Houston was hard to swallow in comparison to my classmates seemingly “perfect families”. I met my now very close friend, David on my seventeenth birthday. He introduced me to the sport and I’ve been hooked ever since visiting Stone Moves (a stellar climbing gym in Houston, TX.) Climbing completely turned my life around. My experience with the sport has reinstalled a passion for life. Living in Houston, outdoor climbing options are far and few between. I spent a year climbing five days a week at Stone Moves. I went to a few local comps, and competed in the SCS season last year. I visited Reimer’s Ranch infrequently, and made a couple trips to Horseshoe Canyon Ranch in Arkansas. I went on a college visit to Northern Arizona University (NAU) located in Flagstaff, Arizona spring break of 2014. During my visit in Flagstaff, I went crack climbing at Paradise Forks for the first time. My first trad lead was at The Overlook a few days later. My first lead on trad wasn’t necessarily terrifying seeing as it was mostly face climbing and I had already sent a few hard sport routes. I left Arizona looking for more, and came home to Houston to immediately enroll at Northern Arizona University. I returned to Flagstaff during the summer for a week of orientation and- you guessed it- more climbing; specifically I was taken on my first multipitch (Sedona’s Scenic Cruise 5.9). The heinous approach through classic Sedona washes, cacti and slabs made me question why I would ever get into trad seeing as it was so much work. However when I was leading a pitch 600 feet off the deck I knew I was hooked. I was pushed into harder trad climbing and to be completely honest, I hated it. At that point I had sent a few 5.11 and 5.12 sport routes and was very frustrated at how difficult crack climbing was for me. I definitely cried a lot after taking my first trad fall. I found myself disheartened by crack climbing, and took a break from it until I met my best friend up here, Nick. Nick got me psyched on trad climbing after doing more multipitches in Sedona, AZ. It took me a while to get confident on placing gear, and it wasn’t until my first trip to Indian Creek that all of that changed. At the creek I quickly picked up the technique and was head over heels for the sport. I became a lot more confident in my abilities to place gear, and how well the gear works after taking many whips on harder routes while I was there. 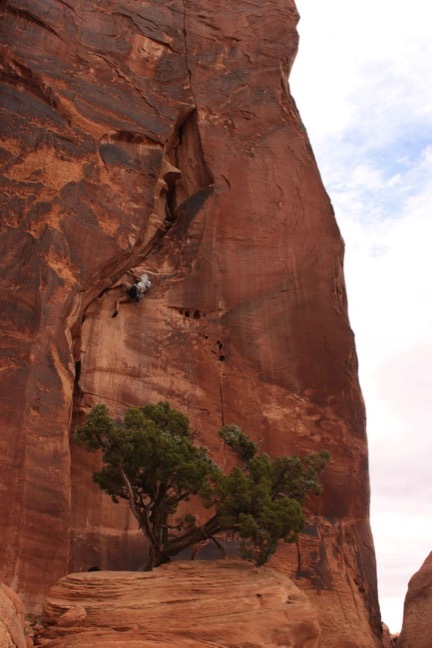 My favorite place to climb hands down, is Moab. 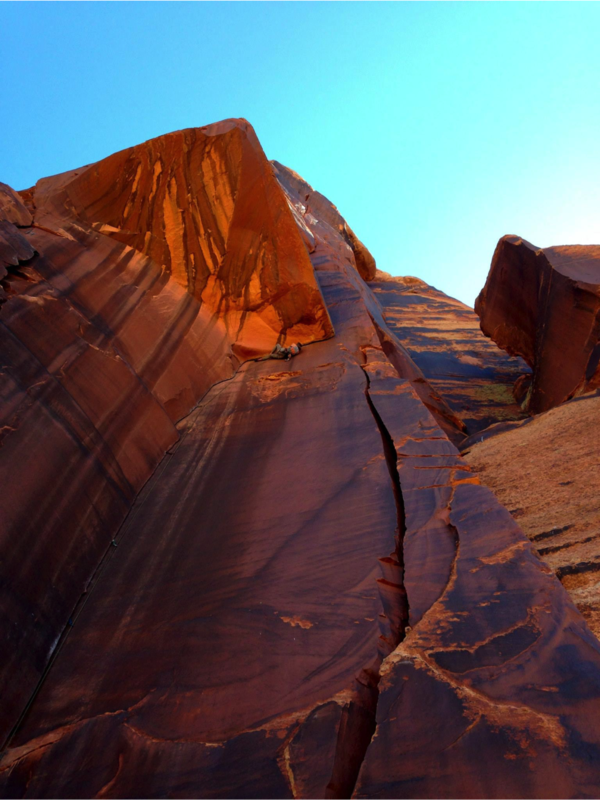 From the perfect sandstone splitter cracks- to the gorgeous, life-changing desert towers. 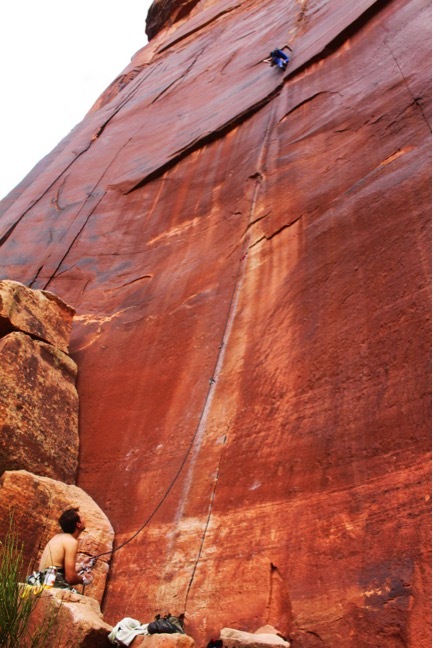 Indian Creek, located right outside of Moab made trad climbing what it is to me. If ever given the chance to go there, TAKE IT. My favorite multipitch I’ve done is Fine Jade, I was able to lead the whole route and every pitch was beyond dope. 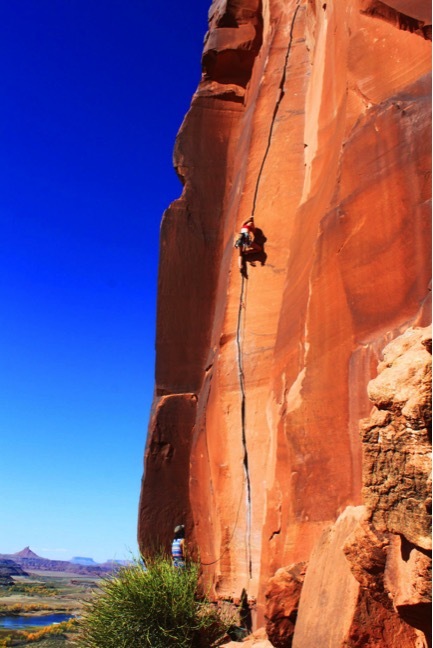 My favorite single pitch trad routes are Coyne Crack, Annunkai, and Super Cat of the Desert. The appeal for trad climbing is definitely not the same as Bouldering or Sport climbing. A huge part of the lack of popularity in trad is due to the higher level of risk involved. There’s more work involved- both mental and physical, and I’m not necessarily talking about strength- you’re just having to make so many more calculated moves and there’s never a sure spot to rest on while you’re placing your own gear. I’ve had moments in Sedona where I was scared beyond belief, well above my last gear placement, and plugging another poorly placed cam for mental duct tape. But in a way I love the excitement that comes with trad climbing. It’s an all-day adventure. You come home sweaty, dirty, exhausted, starving, and wanting to climb the next day. The feeling of being totally self-reliant is the biggest appeal of trad climbing for me. 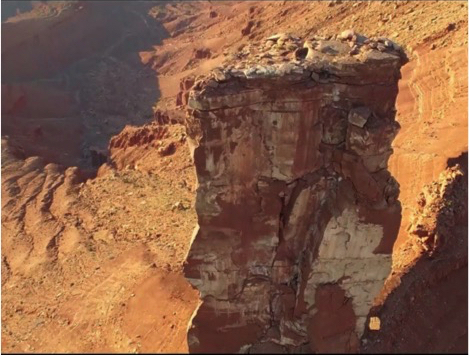 I am much more satisfied on the top of a 500 foot desert tower than I am making a few hard moves on a boulder problem. There are people who think trad climbing is monotonous and boring but I can attest to the fact that I’ve thrown crazy heels, cut my feet, and done a lot of crazy mantling 100s of feet off the deck. Trad climbing takes you so much further than sport climbing or bouldering ever can. I’m not bashing either discipline, I’ve just seen the doors that the ability to climb trad has opened for me, and the options are endless. My recommendation for someone interested in getting into trad climbing is to find the right people. My first few months living in Arizona I spent gym and sport climbing before getting in with my current friend group of desert trad rats. In addition guiding services are a great way to safely learn how to trad climb. I’ve never used a guide personally, but I’m friends with a guide, and have friends who have used guiding services. And I would strongly recommend a guide for your first time. I’ve only heard positive reviews. The most important thing to remember is to stay positive during your first few times out crack climbing. You might get shut down and very frustrated (like I did after spending 45 minutes in a squeeze chimney). But the style of crack climbing is much different and more technical than some other aspects of climbing. It’s not always a bad thing to be humbled. As silly as it may sound, YouTube videos are a great resource for learning basic jams. If you have any questions feel free to email me at aubreyah@yahoo.com. I’m more than happy to talk to any aspiring trad rats!